The tenth anniversary of September 11th, 2001, fell on a Sunday and, providentially, the readings proposed for the Catholic liturgy that day have to do with forgiveness. This interesting confluence provides the occasion for reflecting on this complex and oft-misunderstood spiritual act. Osama bin Laden and those wicked men who hijacked the planes on September 11th not only killed 3000 people; they also haunted and terrified the rest of the world. We feel this in our bones and we remember it every time we go to the airport and are compelled to remove our shoes and belts and submit to humiliating body searches, etc. Were we and are we legitimately angry about September 11th? Absolutely. Thomas Aquinas said that anger is the natural response to injustice, for it is the passion to set things right. Martin Luther King was angry at racial inequality in mid-twentieth century America; Gandhi was angry at the injustices born of British imperialism; John Paul II was angry at Communist oppression in his native Poland—and they were all justified in their anger. This is why the Bible coherently speaks of God’s anger. It doesn’t mean that God passes into an emotional snit; it means that God consistently desires to make right a world gone wrong. Can anger legitimately conduce toward the prosecution of criminals, the formulation of tough laws, the imprisonment of dangerous people? Yes indeed. But in contradistinction to legitimate anger, there is what the Catholic tradition calls the “deadly sin” of anger. This is an exaggerated or irrational desire for vengeance, a passion that is untethered to love. Love, of course, is not an emotion, but rather a determination of desire, an active willing of the good of another. King didn’t want to destroy White America; he wanted to redeem it; Gandhi didn’t want to annihilate the British; he wanted to convert them and see them off as friends; John Paul II didn’t want to kill the Communists; he wanted them to become better people. In all of these cases, anger was situated in the more fundamental matrix of love. In light of these clarifications, we can begin to understand what Jesus means by forgiveness. Authentic forgiveness has nothing to do with willful ignorance (“forgive and forget”) or with a pollyannaish wishing away of evil. In point of fact, real forgiveness assumes a frank and realistic knowledge of wrongs committed and is accordingly accompanied by legitimate anger. But it is indeed incompatible with the desire for vengeance or, to say the same thing, with the deadly sin of anger, for forgiveness is always an act of love, willing the good of the other. The author of the book of Sirach beautifully catches the negativity of anger: “Wrath and anger are hateful things, yet the sinner hugs them tight.” The deadly sin of anger actually feeds the ego and its needs in the measure that it convinces the angry person of his moral superiority. We sinners remember old hurts, rehearse the offenses of others, and cling to our resentments so as to put ourselves on a pedestal. Accordingly, we hold tight to our anger and utterly forsake the path of love. Forgiveness stands athwart such a move. Recalling the tenth anniversary of September 11th 2001, we should remember, we should be angry at the gross injustice done that day, and we should forgive. 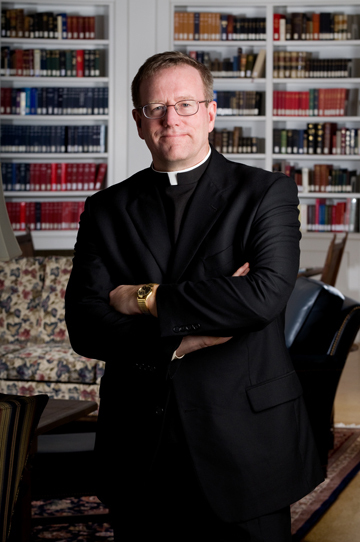 Father Robert Barron is the founder of the global ministry, Word on Fire, and the Francis Cardinal George Professor of Faith and Culture at University of St. Mary of the Lake in Mundelein. He is the creator and host of a new ten episode documentary series called “Catholicism” premiering this Fall on PBS. Learn more about his ministry at www.WordOnFire.org.